Before you put your hyperactive and/or anxious puppy or dog on Prozac, why not try one of the non-prescription natural products often recommended by veterinarians for 'nervous' Buddys and Bellas, whether they are situationally fearful or just 'high strung." The format you use depends on whether your puppy or dog is generally hyperactive or is nervous in certain situations, like during thunderstorms or when visitors come. For general hyperactivity, I would recommend the collar, as the calming pheromones will be with him at all times. For situational stress, the spray, or even the diffuser might be used. 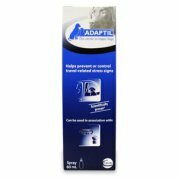 Refills are available for the Adaptil diffuser. 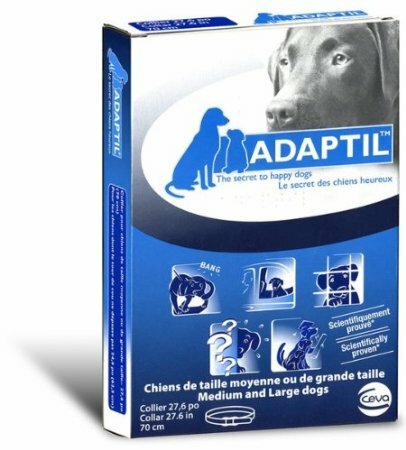 The use of Adaptil is preferably as a temporary aid for calming your pet. Ideally, you will support it with behavioral modification. Otherwise, you will have to continue using the treatment for the same situations, and eventually, it might not perform. 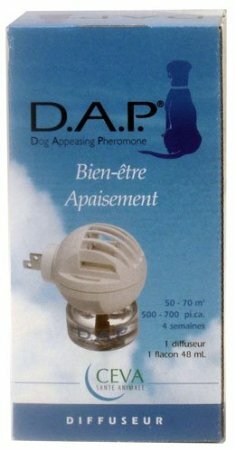 Consumers on Amazon generally love these products, but hate the fact that they have to buy them repeatedly when they run out; the answer to this is to use behavioral techniques to modify, over time, your pup's immediate reactions to threatening situations. There may be occurrences of your pet's fears, however, like going to the vet or moving to a new home, remodeling your home, or bringing a new pet into the home, which bring on a great deal of stress for your pet, but do not re-occur very frequently, and for those occasional times, it is perfectly okay to rely on Adaptil.